Lettuce wraps are a great way to enjoy delicious wraps and sandwiches without the calories and carbs of a flour wrap or bread. Unfortunately, you’ll also end up looking kind of like a kid with their first cake. I mean, is there any way to eat them without ending up with the juice EVERYWHERE? Those adorable little Asian Chicken Lettuce Wraps are appetizers, so you’re supposed to just pick them up and pop them in your mouth. But, without fail, I always end up with juice dripping down my chin and all over my hands. Not so ladylike. However, I recently decided to fix that problem – by making it into a full meal that’s got the same fresh, delicious and wonderful flavors but without the mess while you’re digging in. I made the Asian Chicken Lettuce Wraps into a salad bowl. And let me tell you – it’s amazing. I kept the flavors the same with this delicious dish, but I added more lettuce and made it into a bowl instead of a wrap. This makes it a full meal instead of an appetizer, but since a majority of the bowl is lettuce, it doesn’t mean it’s got a lot of points either. And, since I used ground chicken, it helped keep the points low as well. What really makes this exceptional is the delicious blend of flavors in the sauce. The sauce has all those classic Asian flavors – soy sauce, garlic, ginger and sesame. A little bit of rice vinegar adds a little zing and acidity to the sauce, and a little honey helps to smooth out the flavors. On top of the wonderful flavors of the sauce, a few chopped cashews and a little fresh cilantro round out the classic Asian flavors in this dish, and add a nice bit of texture. I know of several people who really don’t care for cilantro, but for me, having just a little bit of it in this dish is essential to getting the right taste. One of the things I love about this meal is its simplicity and convenience. It’s so easy to put together. 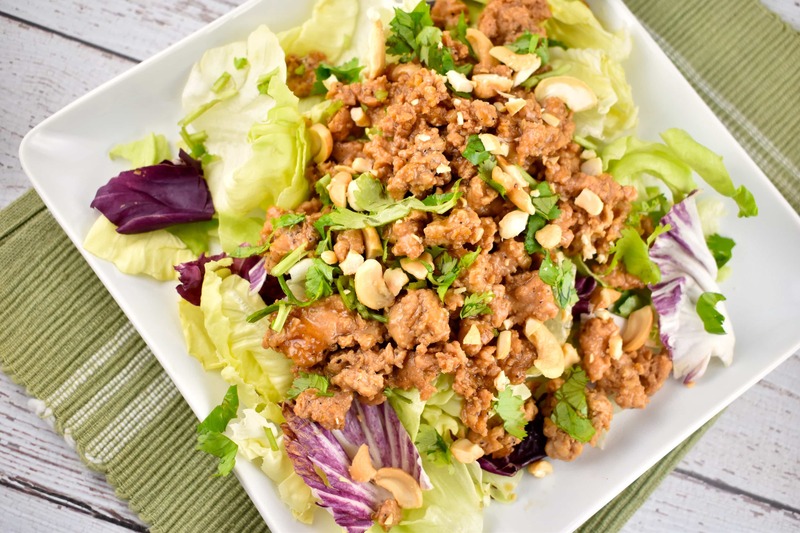 Just brown the chicken and season it, then plate the lettuce and chicken and garnish with the cilantro and cashews. You’re done. It’s so fast that it’s become a perfect meal for us when we’re a little short on time. Since it’s a whole meal in a bowl, instead of little appetizers, it’s super-fast and super delicious. Even my kids love having this for supper – and that’s high praise for a salad! Meal prep is popular right now – and with good reason. A little planning and a couple of hours of prep and you have all your lunches or dinners for the week ready to go. This lettuce bowl is perfect for that. You can cook up the meat and season it. Then just refrigerate until you’re ready to reheat it and serve it with the lettuce, cashews and cilantro. I’ll always have a fond spot for those delicious Asian Chicken Lettuce Wrap appetizers, but for me now, it’s all about this quick and easy but seriously delicious Asian Chicken Lettuce Wrap Bowl. A much easier to eat salad version of this popular Asian recipe! Still full of all the amazing flavors you crave, but less mess. Heat olive oil in a skillet over medium high heat. Add in chicken and saute until browned. While chicken is cooking, whisk together soy sauce, sesame oil, honey, garlic, ginger and rice vinegar in a small bowl. Pour sauce into the pan with chicken and bring to a low simmer. Mix cornstarch with 1 tsp water, and pour into chicken/sauce mixture. Cook for a few minutes until sauce has thickened. Divide lettuce evenly into 4 bowls. Top each bowl with 1/4th of the chicken and sauce. Garnish with cilantro and cashews. Hi. I’m just throwing this together and the directions call to add in the rice vinegar but it’s not listed under the ingredients. Help please!!! Thanks for catching that! I updated the recipe to reflect it. It’s 1 tbsp of rice vinegar.